Love the picture of your bookshelves, and are those vintage travel type posters in the background? I love that vintage look. Can't wait to hear what you thought of Tessa Arlen's latest as well, as I real;ly liked her first one. I'm still a few episodes behind on TWD but liking this season for the most part- I heard the midseason premiere was really good. Hopefully will get caught u this week. And yeah agent Carter seems a little lackluster to me, i like the idea of it too but it's not grabbing me as much as I thought it would. Greg - The posters are vintage Disneyland posters. 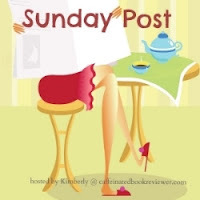 :-) I enjoyed Tessa Arlen's latest. I hope you will too! I hope you are able to get caught up with TWD soon. I probably won't get to see tonight's episode until Friday (which will annoy my coworker as she hates not being able to talk about the show with me). It's good to know it's not just me regarding Agent Carter. Glad Mouse is feeling better, sometimes quiet days are the best. I love getting caught in the rain!ove your reading space..nice and bright :) Hope this week is a good one for you! Kimberly - Yes, those quiet days do have their uses. I tend to like them more than my daughter does. A true sign of age, no less. :-) Rainy days are the best! I hope you have a good week as well! I always drool a little when other bloggers share pictures of their shelves, Wendy, and yours are really yummy! I'm glad things are better at school for Mouse, it's not good when there is trouble, school should be a safe place. I hope you'll have a great week ahead, even if it'll be busy. Happy reading. Lexxie - Aw, thanks! I love my shelves. I begged my husband for the shelves when we moved into our new house five years ago. I am glad things seem to be better at the school too-although I am still feeling cautious. It's still early yet. Wow.. I love your reading/blogging space Wendy!! It looks so cozy. My favorite reading spot is definitely on the couch in our living room, or in bed. When we move to another house, my first priority is getting a nice reading corner or something! Have a nice week and Happy Reading! Maureen - Thank you! It is comfortable, especially when I spread out and take up the entire couch. :-) I hope you get your nice reading corner or space when you move. Havea great week! The weather here has been crazy, too. Last winter we had storm after storm in February. This February we have had lots of rain and more in the forecast. We haven't had any actual snow in like a week and can see the ground! Kelly - That is odd--your part of the continent with no snow this time of year. I hope our current warm weather doesn't mean we're in for a hot summer . . . I hope you have a geat week! Stay warm and dry. Beautiful library. Love your couch. I like outside or in the winter on my couch in the den or living room. Happy Sunday and Happy Reading!! Elizabeth - Thank you! My daughter's the one who decided it should be called the library--probably because of all my books. :-) It gets too hot to read in the summer here. Today would be a good day to read outside--I just wish I had a nicer view! I hope you have a wonderful week! I heard California had gotten really hot weather for so early in the year. Your reading and blogging space looks so inviting. I like all the books shown behind you. I tend to read in our family room and also in bed before sleep. I especially love to read when I first get up in the morning since sometimes I get up around 5 a.m. The house is quiet and one of my cats usually goes to sleep on my lap--perfect for reading. I'm like you - I like to read wherever/whenever I can. I'm glad things are better at school for Mouse. Kathy - With reading time as scarce as it sometimes is, anytime is valuable. :-) I am glad things are better for Mouse at school either. Hopefully it will stay that way. Looks like a good week. I enjoyed that you stopped by my blog for BBAW! My favorite place to read is the bathtub! Joy - I think my daughter will be a bathtub reader. :-) I prefer showers, and so never took to bathtub reading. Jenclair - I especially like to read in there when it's raining. :-) Your reading spot sounds very comfy, Jenclair. I think if I had a pretty garden like yours, I would like to read outside more. :-) Have a great week, Jenclair! The picture of Mouse is so cute! She looks so contented in her own little world. I like your reading spot. It looks like an inviting place to curl up and read. I didn't participate in BBAW but I really enjoyed all the posts. Have a great week and hopefully Mouse will have a growth spurt so she can ride the bumper cars soon. Katherine - I love that photo of Mouse. :-) She felt so pretty that day. Mouse is already growing so fast. I can wait for the bumper cars even if she doesn't want to. Haha I hope you have a great week too! Walking dead was fabulous last week! Although except for the first scene of the episode, I already knew what was going to happen because I had read the comics. Still, it's always fun to watch the show. Love that photo of Mouse - she looks so adorable and lost in thought. Athira - I haven't read the comics, but the talk of them is so prevelant it's hard not to know what's happening in them. I actually read a spoiler about the show, and so it wasn't a complete surprise. Still a good episode though. I totally missed BBAW...don't know how that happened, but I've read a few posts. Off to check out your links. Laurel-Rain - There's just something about a rainy day that brings out the child in me. :-) I'm glad to share that joy with my daughter. OMG, I LOVE your library!! That couch looks SO comfortable, as well as beautiful. And those shelves! I'm turning a slight shade of green....lol. I also like your posters, and the lamps! What an inviting place to read! Mouse looks SO adorable in her pink dress, with her pink rose! You are so blessed! And I'm very glad to hear that the boy who was bothering her has been dealt with, and that the school has taken steps to ensure this doesn't happen again. I was bullied myself when I was in 4th grade, so I know the feeling! I wish I had found out about BBAW sooner, as I would have loved to participate....oh, well, there's always next year, right? I'm going to go through some of the BBAW posts. They look very interesting! Maria - Thank you. Couch covers do wonders for making old furniture look new. :-) And thank you for the kind words about my daughter. I definitely do feel blessed. We love to color together. Mouse prefers my coloring books to her own these days, but I don't mind sharing. I so hope they have another BBAW next year. It was such fun to participate again. I'm sure you would enjoy it! I hope you have a great day too, and an even better week! You're very welcome! Children are definitely a blessing from God! I sure hope I can participate in BBAW next year! That library reading space looks absolutely divine! I don't have a specific place, but early in the morning on my couch with my cat snuggled close is one of my favorite reading moments. Kim - Reading with a cat cuddling on you is the best! This weather is nuts, isn't it? I think I'm enjoying season 2 of AGENT CARTER more than you are, although I do miss the New York City setting this time around. Your reading/blogging spot looks so cozy! Have a great week, Wendy. Florinda - It looks like we are in for some warmer days coming up. I am glad you are enjoying Agent Carter. It's certainly an interesting storyline and I love how strong the women are in the show. I hope you have a great week too! Tiffany - I glad to see it back too! I don't think I'll get to see tonight's episode tonight, unfortunately. I'm anxious to see it though. I've kind of wondered that too about Agent Carter. There's been very little mention of race issues given the time period (although there was some initially). I do love that the women shine in the show though. I hope you have a great week! Laura - She's off in her own little world. :-) I wish I could spend more at home reading. I'm not sure my boss would appreciate it. Haha Have a great week, Laura! Love your reading space! 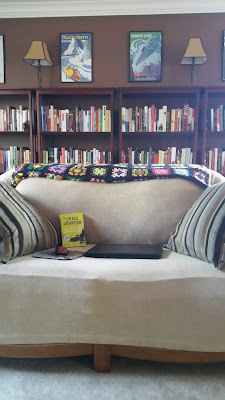 I don't know that I have a favorite space, although my favorite corner on the sofa is the place I read in the most. Well, try to read because the television is always on in the same room but I like to be where my family is, too. Lisa - There's no television in the library, although it's right in the next room, which is in view--so not completely separate. It can definitely be a distraction. Eustacia - I am too! I was worried it would turn into something worse given how sick everyone seems to be around us. I hope you are enjoying your week! I've enjoyed reading all your BBAW posts, Wendy. 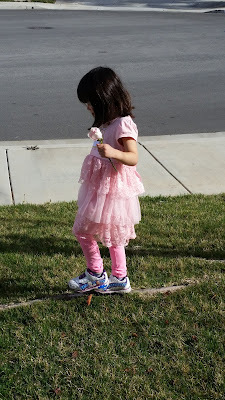 And I'm glad to hear things are getting better in school for Mouse (I love her pink dress!). I like your reading space; it definitely looks comfy and cozy. Hope you've a great week ahead! Melody - Thanks, Melody! 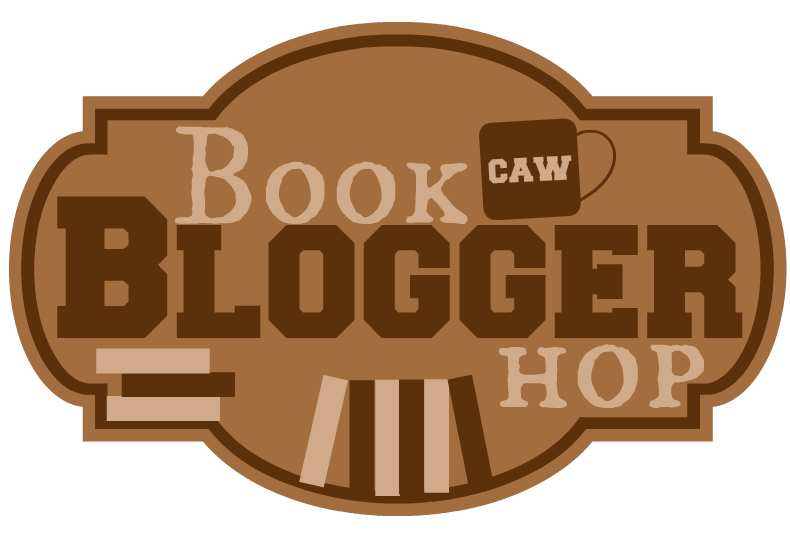 I enjoyed participating in BBAW--although I know I couldn't post like that regularly. Mouse loves her dresses! :-) I hope you are enjoying your week so far! BBAW was a great week wasn't it. I will have to check out the post on Mothering and Social... My favourite place to read is my bed but I will read anywhere I have the time, the kindle is always with me for that reason. Ooh, your reading spot looks so nice! I love it! I've been away from blogland and I missed BBAW! 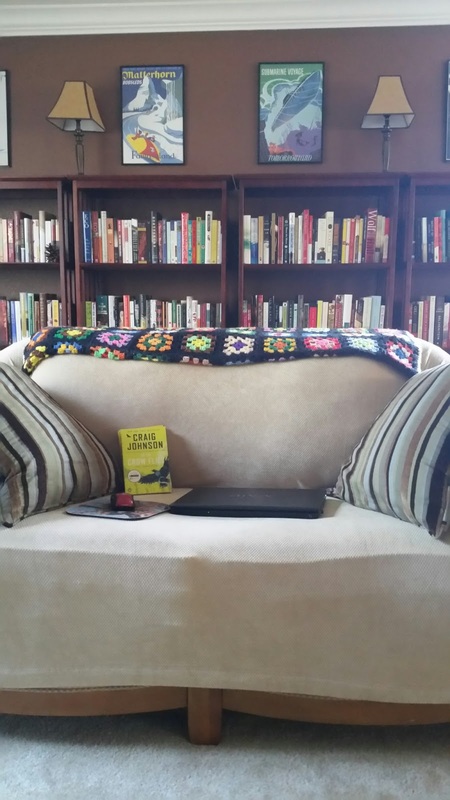 Your cozy couch looks like the perfect reading spot. Oh my gosh, The Walking Dead is back and so good like always. That premier episode was wild. I love Daryl lol. The thing with Rick now though, I don't know, those two seem more like brother and sister to me. She's too cute with her flower on Valentine's day! I wasn't too surprised about the Rick thing. It'd been coming for awhile now, I thought. But I know what you mean. I kind of saw their relationship the same way.